Skeleton Crew, the final play in Dominique Morisseau’s Detroit trilogy, just finished its run at Northlight Theatre, directed by Ron OJ Parson. The play is set during the economic crisis of 2008 in the breakroom of one of the last small autoparts plants standing. This is highly skilled work and the men and women who do it are proud, and proudly union. But their jobs and way of life are hanging by a thread. Faye (Jacqueline Williams) has had a thirty-nine year career doing every manner of job in the factory. She’s also union rep as well as unofficial matriarch. Faye mothers her two young coworkers, Dez (Bernard Gilbert) and Shanita (AnJi White) with a mix of deadpan humor and straight talk. Their unit manager, Reggie (Kelvin Roston Jr.) is torn between trying to save his worker’s jobs and trying to prepare them for the inevitable. When factories are closing unions have little leverage and Faye’s lifelong relationship with Reggie complicates her ability to be the best union rep she can as things get more and more desperate. Morisseau’s artful dialogue slips from hilarious comic exchanges, to tension filled battles, to poignant monologues and back again. At moments the play is reminiscent of August Wilson. Her beautifully wrought characters are grounded, specific and say what they feel. Williams plays Faye as relatable, lovable and intensely sympathetic. Faye is also a proud lesbian, at one point bragging she’d be more successful at getting a women to fool around in the backseat of her car than Dez. But underneath all of Faye’s charm and confidence is a lot of pain, a son who won’t connect with her and a partner she’s lost. The factory family is her true family and she struggles to look out for them while hiding her own personal struggles. Outside the factory the world is falling apart. Rising unemployment and poverty are devastating Detroit’s already embattled working class black neighborhoods (the history of housing discrimination and the entrenched segregation it created in Detroit is so well known it goes without mention in this play although it informs it). Reggie, who has recently bought a house in a more affluent area and is on the cusp of sending his daughter to college, worries about losing everything if the plant is shut down. And Shanita, pregnant with her first child, has always expected to make a career as a skilled worker, like her father before her, but now faces near certain downward mobility. 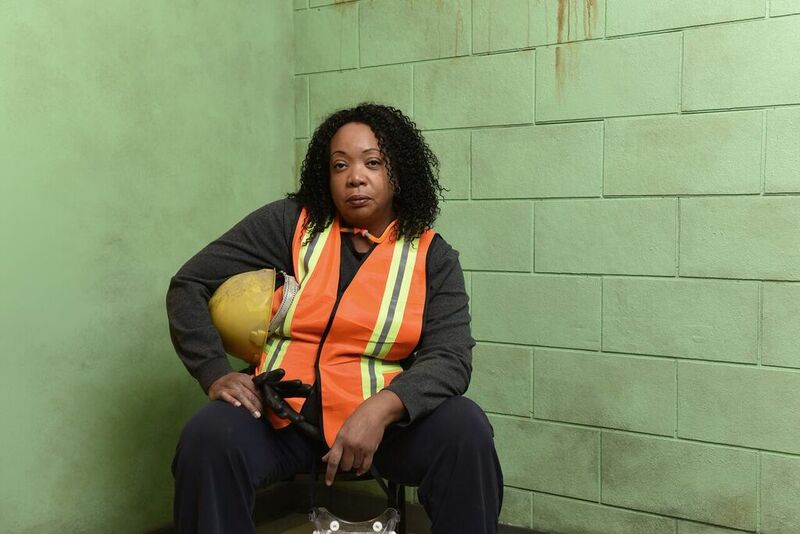 Shanita has some of the best monologues in the play about the dignity of making something and her pride in the American auto industry. The production design evokes the atmosphere of the factory. The sound design (Ray Nardelli) captures the rhythm of the machines, which Shanita lovingly compares to music. Hanging down above the ceilingless room is a suggestion of machinery with hooks and pulleys hanging down that move between scene breaks in coordination with sound and light cues. In her program note Morisseau says this play is about, “The workers on all sides of the line who are trying to negotiate their survival and the revolutionary union movements that pushed the soul of justice into the labor force.” The tragedy of Skeleton Crew is the unraveling of lives and communities, the disappearance of these union jobs and the unmaking of a city. *Note: This production has closed, and this review is intended to be used as historical record of public opinion of a performance.